All responsible companies have incorporated safety into their work culture to ensure that their employees, equipment, and the public is safe during the course of their work. According to OSHA, 5,190 workers were killed on the job in 2016 (https://www.bls.gov/news.release/cfoi.nr0.htm). 7.3% of these deaths are due to getting caught-in/between machinery. Getting caught-in/between machinery is one of the four leading causes of fatality among workers. Industries are regulated by OSHA standards to prevent injuries to workers due to powered industrial trucks. 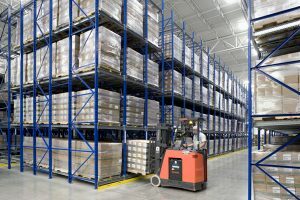 Various industries rely on forklifts on a daily basis in their warehouses, delivery bays and other industrial settings. These machines are quite handy in moving and lifting heavy loads in the workplace. They can also be very dangerous. Employees who work near forklifts can be struck or crushed by them. Pedestrians can also get fatally injured by the load being handled by the forklifts. Application of forklift LED warning lights is recommended to avoid these types of accidents in the workplace. 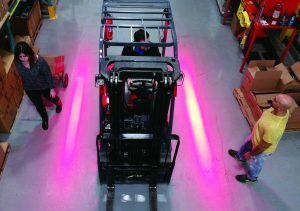 Mounting Red LED Pedestrian Warning Lights on a Forklift Helps Create a Visual Border or “Cushion of Safety” Between Pedestrians and Forklifts. Forklifts are heavy and have a large turning radius. They can run into employees who are not paying attention. It can also run over the feet of people who are standing too close to the machine. It is very important to ensure that pedestrians stand at a safe distance while a forklift is being operated. This is commonly referred to as creating a “cushion of safety”. Having a projected light on the floor will remind them to stand outside the perimeter and be safe. A safe zone border is the most pragmatic solution to avoid getting crushed by forklifts in operation. The truth is that most pedestrians do not comprehend the danger of the crushing force of a forklift tire. The rear end swing of the industrial forklifts also causes many accidents. Without proper pedestrian training, the workers disregard safety regulations and try to squeeze-by these machines and get seriously hurt. OSHA regulates that all forklifts must be provided a sound producing device – most common ‘horn’ (Equip every power-propelled truck with an operator-controlled horn, whistle, gong, or other sound-producing device. ANSI B56.1-1969 Incorporated by reference [29 CFR 1910.178(a)(2)]). At critical locations like cross aisles and other areas where the vision is obstructed, drivers are advised to slow down and sound horns to warn the pedestrians of incoming forklifts. Drivers are asked to use a combination of sounds and warning lights. Back up alarms are very irritating to workers. These safety devices are sometimes intentionally disabled by forklift operators as they can be very annoying. The sound of backup alarms may fade into the ambient noise. Forklift LED warning lights have the advantage of being very unobtrusive. 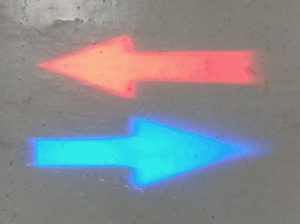 These spotlights which come in red and blue colors can accurately indicate which direction the forklift is coming from and how fast it is moving. 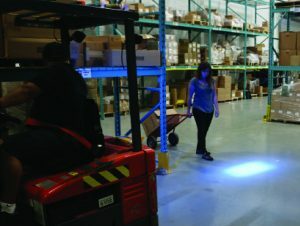 Pedestrians Are Alerted By A Large LED Blue Spotlight Prior to Forklift Coming Into Their Personal Space. The Light is Mounted on Forklift With the Beam Directed 15 – 20 Feet Out From the Forklift. Most of the accidents at the workplace can be attributed to absent-mindedness. LED lights are easily noticeable even while distracted. LED pedestrian safety warning spotlights can be designed to include light beam variations like intense color and large footprint. They can be designed to project arrows on the floor to capture the attention of pedestrians. A flash of light can quickly alert people who are not attentive. Even if they are absorbed in their work, or in their phones people will notice a bright blue light moving in their direction. The installation is very simple and doesn’t require much time. The LED pedestrian safety warning spotlights come with an aluminum housing which is very durable. Easy mount bracket can be used to mount the LED spotlights securely on the lift trucks without drilling into overhead guard (drilling into overhead guard reduces capacity and should not be done without first contacting forklift manufacturer). To ensure maximum safety, it is recommended to install a red spotlight in the front and a blue LED light in the back (or vise-versa). The lights must be wired in such a way that when the forklift is moving in one direction, only the relevant light must turn on so that people can easily identify which direction it is moving. While implementing, it is very important to keep consistency across all vehicles, especially in the distance of beam from the truck and the color of light used in the front and back. Changes in these parameters can lead to dangerous assumptions on the part of pedestrians and other forklift operators. LED warning lights are ideal for installation on different classes of forklifts like Class I (stand up rider and sit-down lift trucks), Class II Narrow Aisle (order pickers and reach trucks), Class III (electric pallet jacks), Class IV (cushion tire sit-down forklifts), Class V (pneumatic sit-down forklifts), Class VI (tuggers or tow tractors i.e. used in airports), Class VII (rough terrain forklifts) and even pedestrian transport vehicle i.e. golf carts. LED spotlights are safe for installing on any piece of industrial equipment. Solid state LED lights are very sturdy and are capable of withstanding shock and vibration. This is very important with forklifts as they lack traditional suspension systems. LED lights do not have any fragile components like glass envelopes that is present in fluorescent, incandescent,and metal-halide lighting sources. In addition, they also do not have any filaments that might break leading to failure. So, there is no risk of sustaining damage during transportation. These safety warning spotlights are long-lasting. LED lights have a lifespan of 50000+ hours. So, there is no need to worry about catastrophic failure at critical points. Maintenance and repair overhead can be greatly reduced by installing LED forklift pedestrian safety warning spotlights. It has been reported that strobe type lights interfere auto-darkening welding helmets. Employees have also complained that strobe lights hinder a persons ability to see due to the fact that they are usually placed at eye level which can obscure employees field of vision. LED lights are directed to the floor and will not affect auto-darkening welding helmets or affect worker field of vision due to the fact that the lights beam is not directed at eye level. Compared to other lighting sources, LED lights use significantly less power. LED units can produce light instantly. There is no downtime in waiting for full output from LED spotlights. Forklift LED warning lights are very popular among consumers of green technology. These safety warning lights are safe for the environment. It should be noted that LED lights can be recycled completely. A safety program that includes forklift operator safety training along with the installing forklift LED warning lights can definitely help in reducing accidents and in promoting a safer working environment. It’s awesome that forklift LED lights don’t need any time to warm up like other LED lights do. That would really save time for the operator of the lift. I bet it would be important to know how to operate the forklift using the lights on the sides, so a safety course would probably be a necessary thing for anyone driving the machine. My son was talking about how he wanted to get certified to operate a forklift, so I’ll tell him to learn about these lights as well in whatever course he takes so he’ll know how to use them. Great post on forklift. Look forward to seeing more blogs from you..
nice blog . its amazing!